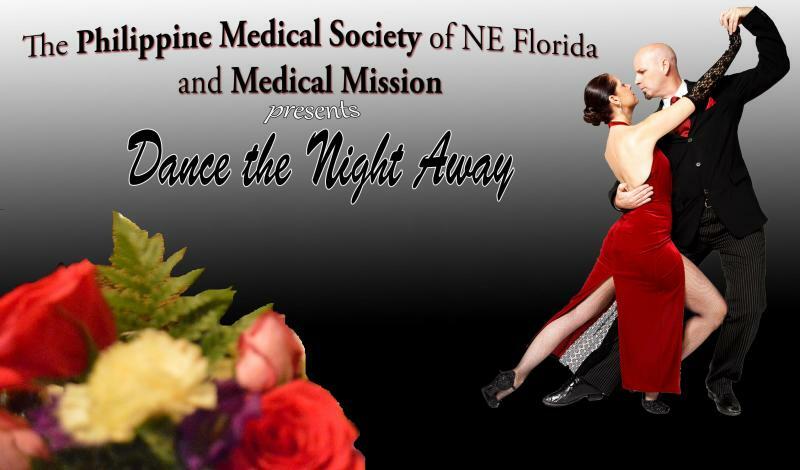 Philippine Medical Society of Northeast Florida, Inc.
You can view the 2019 Induction Ball when you click on the image below. 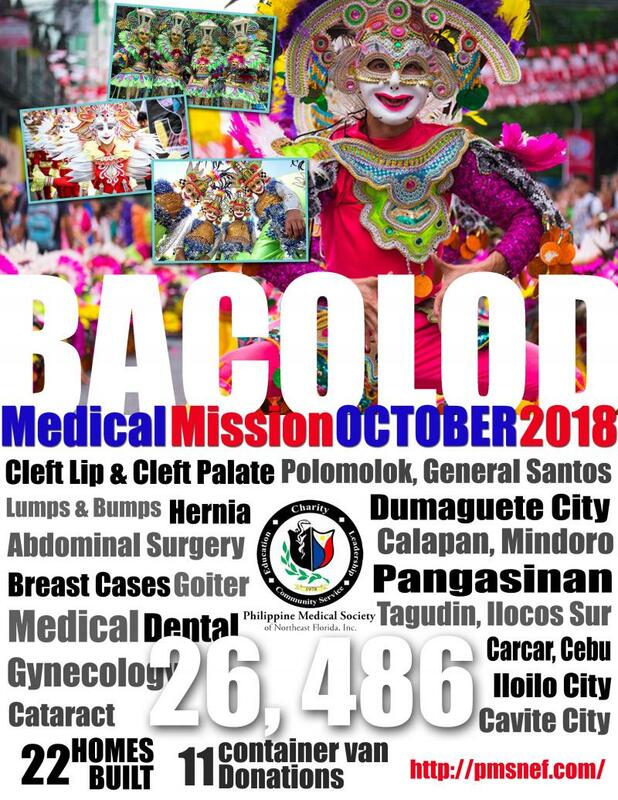 Click on the image to view photos for the "Masskara Festival Fundraising Event intended for the PMSNEF Bacolod Medical Mission 2018. Last week for 4 days volunteers from PMSNEF, Inc,PMSNEF, Inc Auxiliary, Visayas Mindanao Association, Ilocano Association, Palm Coast Group and several other good hearted individuals came and spend their weekends helping load hospital beds, dialysis machines, surgical equipments, and medical supplies.With one truck and 2 trailers, we were able fill up 3 (40ft) container vans up to the brim. Three of the hired workers gave up on us on Sunday evening and thanks to the children of Drs. Patrick and Grace Bunyi for stepping into the plate. Kyle, Roman, Marie and their friend Ashley stayed with us up to late Sunday night and completed the work with a smile. Thanks to Chris Ordonez who has always been with us since we started our Medical Mission in 2005. She drove a limping 26 ft Penske truck with a lift. The truck was so lame that it can only run up to 25 miles/hr on I-10, 295 and 95 highways transporting the goods from the Westside farm of Roman Paje where we stored them for free to the parking lot of Patrick. The truck barely made it out at the backyard of Patrick. She complained to Penske with her South Georgia Farm lady manners and got a break. Instead of paying over $600 for the 4 day rent we paid $215.94. The rainbow over the 3 container vans on the last afternoon made all our efforts worthwhile. 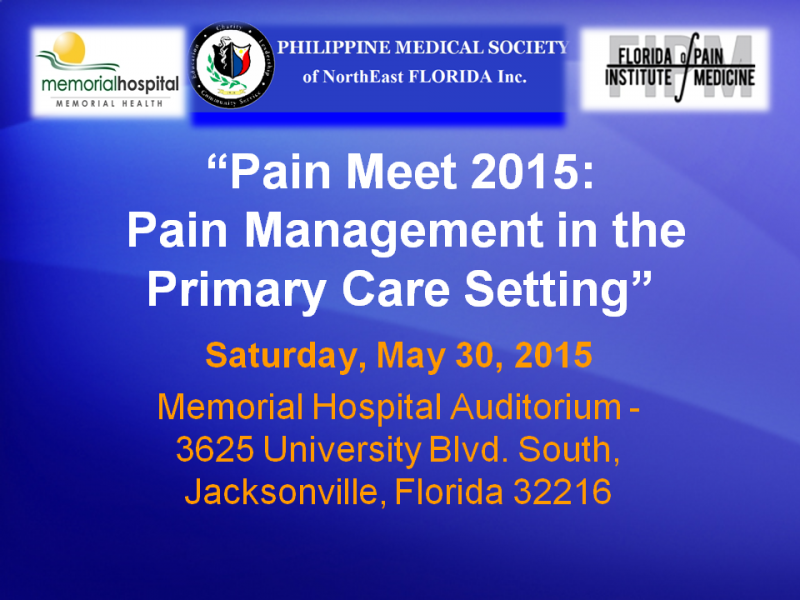 PMSNEF, Memorial Hospital and Florida Institute of Pain Medicine Host FREE CME﻿. Source: The Scope, Memorial Hospital's Newsletter. The Philippine Medical Society of Northeast Florida headed by its president Dr. Melchor Barros initiated a meeting last January 16, 2015 at Dr. Francis Ong's residence. The meeting was held to discuss plans for the upcoming 2016 Cebu Medical Mission. Part of the discussion includes the mission site, the date and the type of mission that is medical, surgical, dental, CME and BLS. To accomplish this mission the group must be able to raise money through fundraising to support shipment of medical equipments and medical supplies for the recipients of this missions. 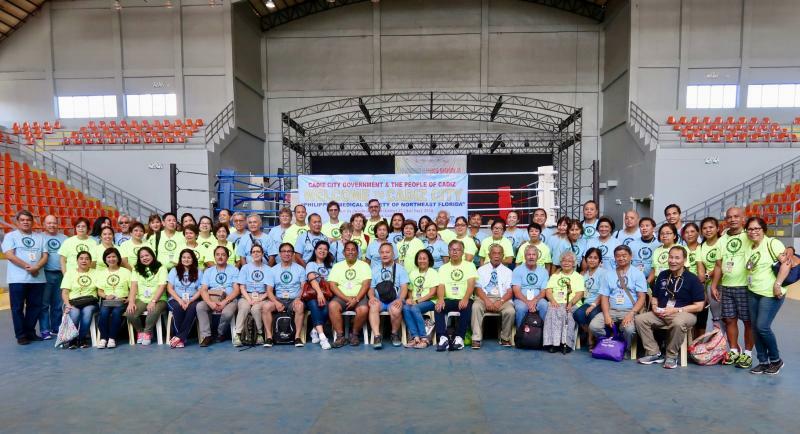 Volunteers have to pay for their own plane fares while the Host volunteers from Cebu, Philippines have to provide them food and lodging to incur minimal administrative expense and help provide more support for the mission. 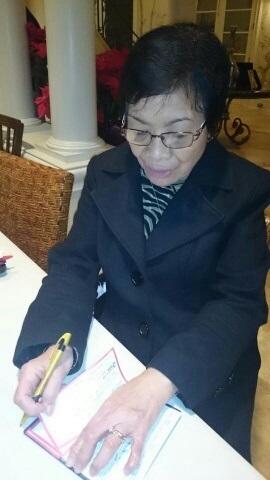 Dr. Ben and Virgie Samera donated $1000 for the cause. Other medical volunteers will conduct symposiums whose proceeds will benefit this mission. It was also suggested to get sponsorships from the different pharmaceutical companies for support. Officers and members were assigned their individual task and were formed into commitees. Other requirements such as licenses and insurances were also laid on the table. To view the photos, kindly click on the link above or image below. 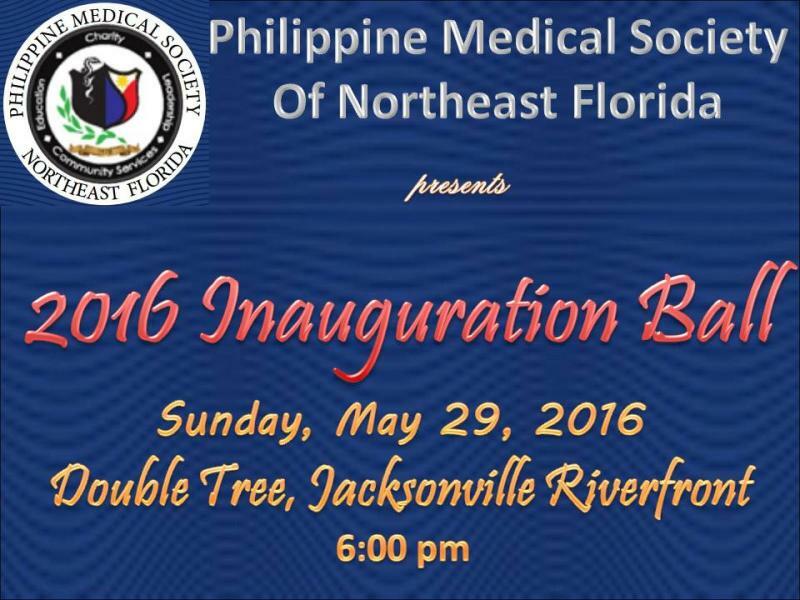 Every 2 years, the Philippine Medical Society of North East Florida, made up of Jacksonville area physicians, goes to the Philippines. While there, these physicians hold a tiring, week- long marathon of seeing medical, dental and surgical patients. This tenacious crew of 50- 100 medical doctors, surgeons, dentists, nurses, and support crew, work around the clock for the entirety of the week seeing a 1000 medical outreach patients daily, 200- 300 dental outreach patients daily, and 60- 100 surgeries during the week. This tremendous endeavor is actually the culmination of 2 years of hard work. 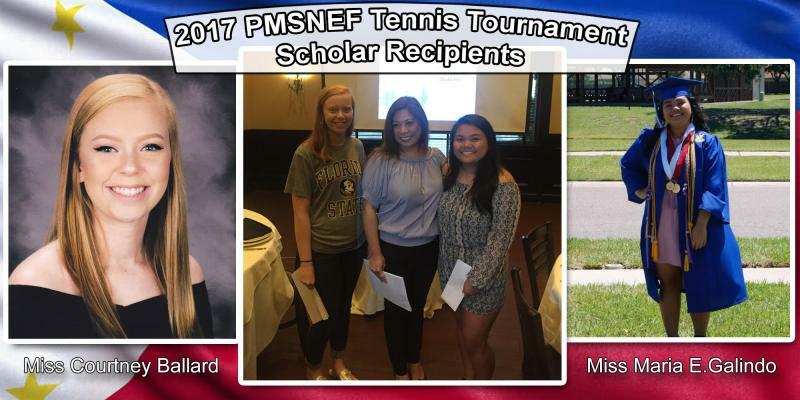 The two years prior to the mission, the PMSNEF and the PMSNEF Auxiliary groups work tirelessly creating fun and memorable events for fundraising, such as golf and tennis tournaments, and charity balls including the upcoming "Dance the Night Away,"on August 22, 2015. 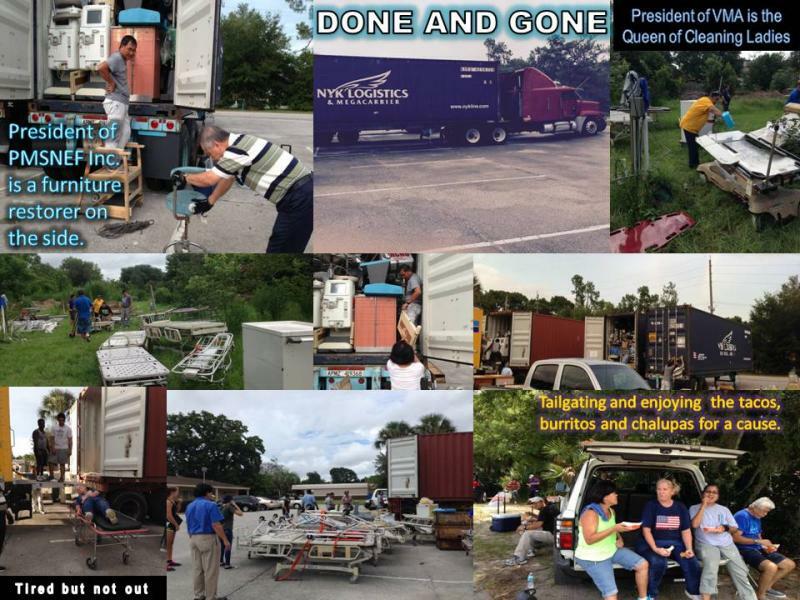 Along with the fundraising events, the resourceful members gather the necessary medical equipment to ship to the Philippines for the missions and to donate to hospitals, clinics, and dialysis centers. This group does a lot of good abroad, but also works to serve the local community. Though, this society is mostly comprised of Filipino- Americans, they are all proud Americans that often gives back to the immediate metropolitan Jacksonville Area. The PMSNEF participates with the Legacy of Care Health Center, which is a free clinic based out of the Arlington Area. In partnership with the Legacy of Care association, the PMSNEF carries out and facilitates health screenings, and other community services.This Saturday morning, August 1st 2015, they participated in the back to school event at Edward Waters College, seeing students and giving school physicals just in time for school to start. 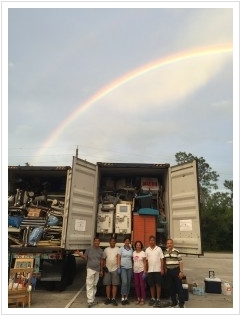 This photo shows, (right to left) current PMSNEF president, Dr. Melchor Barros, Dr Francis Ong, Dr Carmencita Ong, Grace Bunyi RN,Dr Patrick Bunyi, and Mr Tony Baluyot, celebrating the closing of 2 out of 3, 40 foot containers filled with medical, dental, and surgical equipment and other necessary supplies. After a very dreary and rainy day, the rainbow (slight double) and the beautiful blue skies were a welcome sight. We will take the rainbow as a blessing and a symbol of good fortune for our mission. Click on the image below to view photos of this event. I would like to introduce new volunteers for the Cebu Medical Mission.Dr. Matthew and Mrs. Rebecca Barros from New YorkMs. Maya Flores from Jacksonville.Dr. Eden Nuval from CaliforniaAttached is a photo of Michael and Deborah Byerly, avid supporters of our Medical missions and GK houses. They donated $250 for the Cebu Medical Mission.Mr. Greg and Rose Dimayuga donated $500. The final accounting on the Pain Management Seminar held last month will be released when all payments are received from the sponsors. 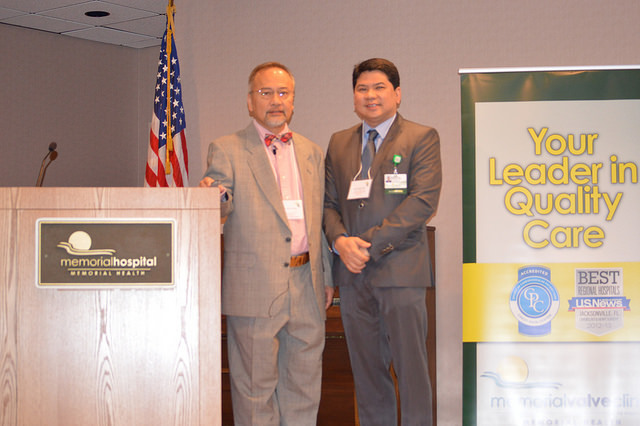 Dr. Bernard Canlas had a good program that was well attended and Memorial Hospital of Jacksonville expressed their interest to host it again next year. 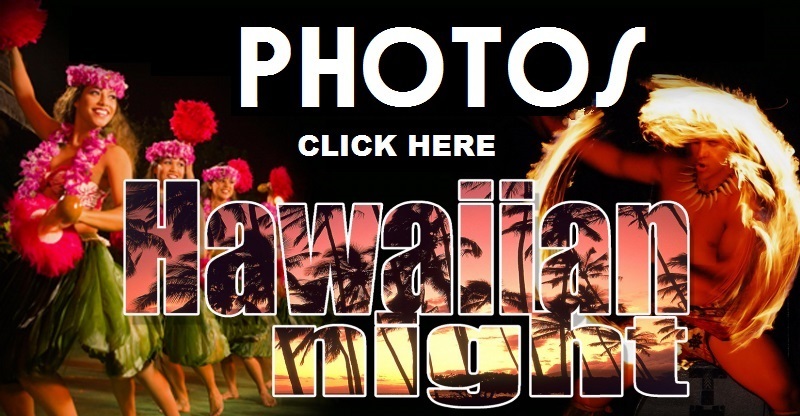 Dr. Betty Mina is busy preparing for our 2nd fund raising event with our Hawaiian Night on July 25, 2015. We have wonderful Friday nights with the children and grandchildren rehearsing their dances with Ms Lally Ferro. If you have teenagers and younger ones (at least 5 yrs old) this is a fun activity for the summer. Click the image below to view pictures of this event. 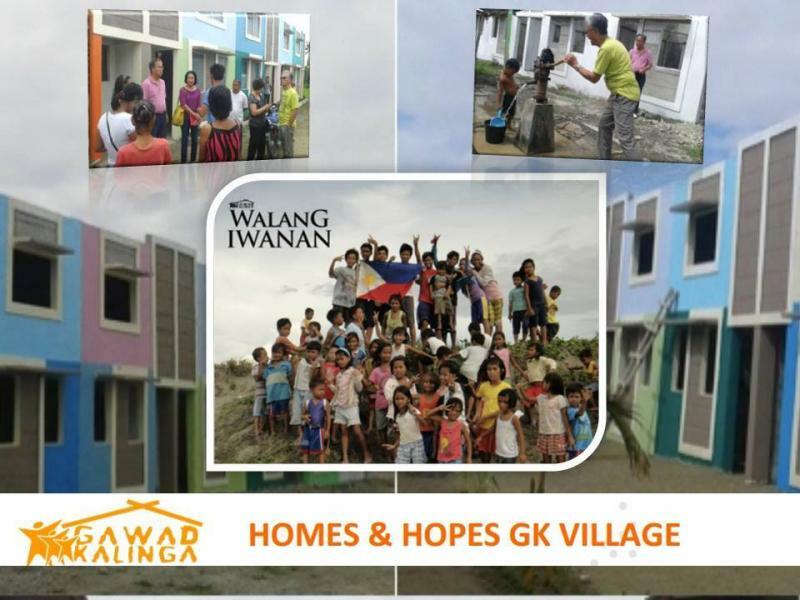 Click on the image below to view the Progress Report for Homes and Hope. 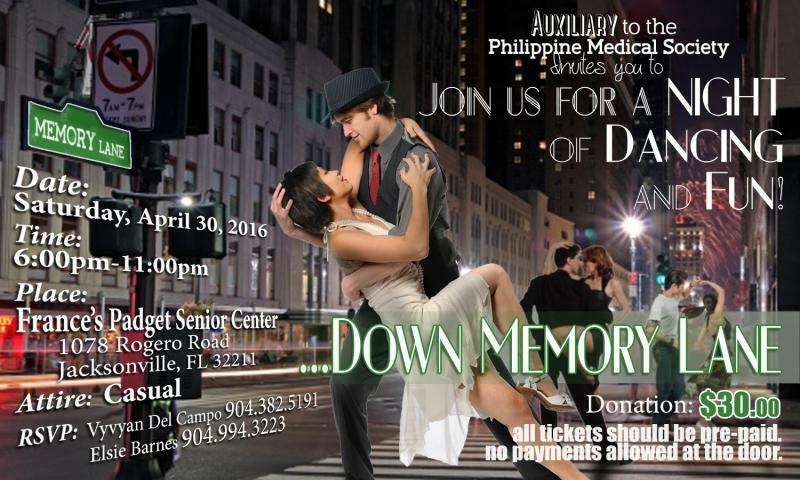 Copyright 2015 Philippine Medical Society of Northeast Florida, Inc.. All rights reserved.